Yes, another pork belly post. I pick up a couple of pork bellies every time I'm in an Asian market and keep them in the freezer, that way I'm always at the ready to try out another pork belly recipe. Cracklin' crisp skin and juicy interior. Using a sharp pointy object prick the pork skin all over being careful to not poke into the meat. Using a sharp knife, score the width of the skin about 1 to 2 inches apart; again, being careful to not cut into the meat. Prepare the scalding hot alkaline solution by adding the baking soda to boiling water. Be careful, it will bubble up. Place the pork skin-side up on a tilted wire rack in the sink. (I had to use a bamboo skewer to keep the pork on the rack. It kept wanting to slide off.) Pour the scalding hot solution over the skin of the belly. Combine the marinade ingredients. Place the pork skin side down on a flat surface and slather the marinade all over the meat side of the belly avoiding the skin. 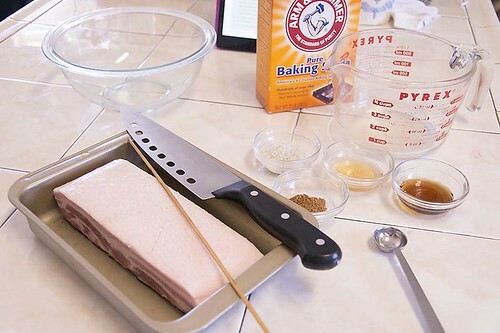 Turn the pork skin side up and place in a baking dish, and set uncovered in the refrigerator. The recipe says to marinate overnight, I started this in the morning for dinner that night, and it was very flavorful. Once again, pat the skin dry then sprinkle with the salt. I used sea salt. 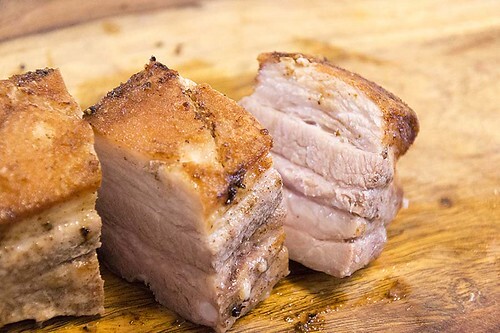 Place the pork belly skin side up on a wire rack over a baking dish. Roast to perfection then scrape off the salt crust. Cut into 1 1/2 inch pieces before serving. OMGosh this is so tender and succulent with just a hint of the 5 spice powder. Place the pork skin-side up on a tilted wire rack in the sink. alkaline solution over the skin of the belly. Pat the skin very dry with a clean cloth or paper towels. Place the pork belly skin-side down on a flat surface. refrigerator so it can come up to room temperature. Fill a foil-lined roasting tray with at least a half-inch of boiling water. the pork belly reaches 160 ° F.
crispy and a char develops, 5 to 10 minutes. the salt and any charred bits. Cut into 1 ½-inch pieces before serving. Locations 3940-3963). Andrews McMeel Publishing. Kindle Edition.